1. Resistant to the destructive effects of earthquakes. 2. No earthquake; without shaking (as exists with an earthquake). Data on hydroseisms in wells are published annually by the U.S. Coast and Geodetic Survey. Slip on faults occurs as a combination of relatively continuous aseismic creep and transient slip events. These transient events occur as earthquakes radiating seismic waves, and also as aseismic events with characteristic time scales of days to years. A better understanding of the physical factors that control the relative amount and location of seismic and aseismic slip is a key goal in the study of fault mechanics and, in particular, can affect assessments of reginal seismic and tsunami hazards. 1. In astronomy, a cluster of stars (or a small constellation). 2. In mineralogy, a six-rayed star-shaped figure seen in some crystal structures under reflected or transmitted light. 3. Etymology: from Greek asterismos, from asterizein, "to arrange in constellations"; from aster-, "star". 1. A defect in a lens of an eye that prevents light rays from meeting at a single point, thus producing an imperfect image. 2. A common form of visual impairment in which part of an image is blurred, due to an irregularity in the curvature of the front surface of the eye, the cornea. The curve of the cornea is shaped more like an American football or a rugby ball rather than normally as a spherical basketball. Light rays entering the eye are not uniformly focused on the retina; resulting in blurred vision at all distances and only part of what a person is looking at is in clear focus at any one time. 3. Etymology: coined in form of astigmatic in 1849 by English scientist William Whewell (1794-1866), from Greek a-, "without" + stigmatos, stigma, "a mark, a spot, a puncture". 1. The emergence of a genetic characteristic typical of a previous generation, which could be caused by a recombination of genes: Some people have the impression that James is reverting to atavisms that existed when he was a child. 2. The reappearance of a former behavior even after a long period of being educated or trained: Mark's dog seemed to be returning to a kind of atavism which it had when it was a wild dog. 3. 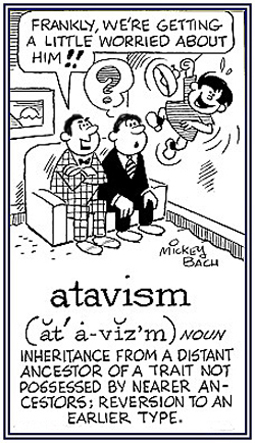 Etymology: from French atavisme; from Latin atavus, "ancestor, forefather"; from at- perhaps here meaning "beyond" + avus, "grandfather"; from "adult male relative other than the father". © ALL rights are reserved. 2. Skill in running, jumping, throwing, etc. 1. Mental introversion in which the attention or interest is fastened on the patient's own ego; a self-centered mental state from which reality tends to be excluded. 2. A mental disorder characterized by severely abnormal developments of social interaction and verbal and nonverbal communication skills. 3. A tendency to view life in terms of one's own needs and desires. Affected individuals may adhere to inflexible, nonfunctional rituals or routine. They may become upset with even trivial changes in their environment. They often have a limited range of interests but may become preoccupied with a narrow range of subjects or activities. They appear unable to understand others' feelings and often have poor eye contact with others. Unpredictable mood swings may occur. Many demonstrate stereotypical motor mannerisms; such as, hand or finger flapping, body rocking, or dipping. The disorder is probably caused by organically based central nervous system dysfunction, especially in the ability to process social or emotional information or language. Information about autism and autistic symptoms. 1. Originating where found; indigenous: autochthonous rocks; an autochthonous people; autochthonous folktales. 2. In biology, originating or formed in the place where found: an autochthonous blood clot. Showing page 8 out of 63 pages of 943 main-word entries or main-word-entry groups.